This mosaic sits, rather randomly, just off the High Street in amongst a small collection of shops. I have no idea where it came from or who laid it but it is a pretty splash of colour in a quiet side street! Beautiful mosaic you posted here. It really has meaning to me because my son is a dragon here in China, well his Chinese sign is a dragon, and a double dragon because he was born in a double year of 1988. 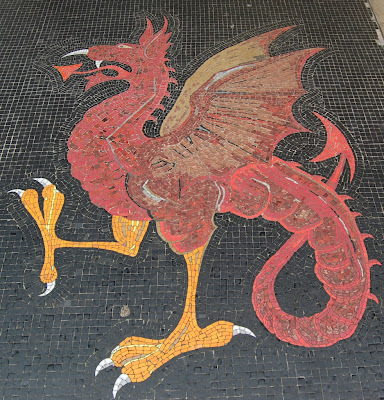 Very lucky are you to have this nice mosaic of the lucky dragon. And this first comment is quite different thinking. This is great in blogging, to see how differently two person can see and think, when they lived in a different culture.